A set of 15th Century sculptures have been garishly repainted by a Spanish parishioner in the latest botched amateur restoration attempt to attract derision in the country. 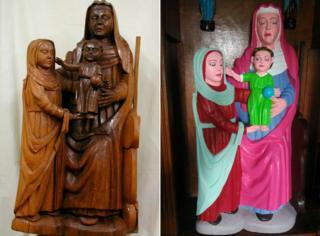 In one of the previously plain wooden statues, Jesus was given a bright green robe while Mary got a bright pink headscarf and eyeliner. Another statue showed St Peter, now dressed in deep red. They are in a chapel in a hamlet in northern Spain's Asturias region. One of the 28 residents of El Ranadoiro, Maria Luisa Menendez, was given permission from the local priest to paint the figurines, local newspaper El Comercio reported. "I'm not a professional, but I always liked to do it, and the figures really needed to be painted. So I painted them as I could, with the colours that looked good to me, and the neighbours liked it," she told the newspaper, quoted by AFP. However Asturias officials were less pleased, with the principality's Education Adviser Genaro Alonso describing it to Efe news agency as a "vengeance rather than a restoration". Spanish art conservation association ACRE also decried the "continued pillaging in our country". "What kind of society stands by as its ancestor's legacy is destroyed before its eyes?" it said in a tweet. In June a church in the northern town of Estella was criticised after it employed an arts and crafts teacher to update a 16th-Century wooden sculpture of St George. The warrior was transformed with a pink face and bright coloured armour. Some online commentators likened the result to the comic book character Tintin. Meanwhile an earlier botched restoration of the Ecce Homo (Behold the Man) fresco in 2012 has since become an attraction in its own right, drawing thousands of visitors to the town of Borja, also in northern Spain. Ecce Homo by Elias Garcia Martinez had held pride of place in the Sanctuary of Mercy Church near Zaragoza for more than 100 years until an elderly parishioner took her brush to it after years of deterioration due to moisture.